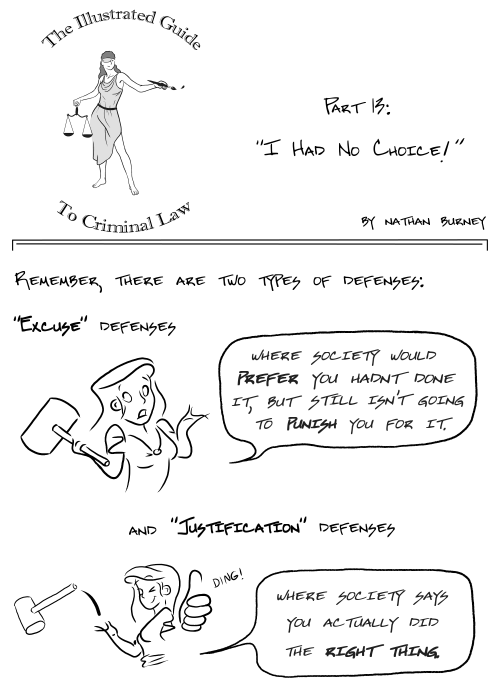 Is there a practical difference between “excuse” and “justification” defenses? For example, a justified act isn’t punished at all, an excused act is punished less severely? Or is it just a theoretical distinction? I suspect that it is just a theoretical distinction. The jury is only allowed to return a verdict of “guilty” or “not guilty” and sentencing is mostly at the judge’s discretion. There are defenses that reduce the conviction from that of a relatively major charge to that of a relatively minor charge, there are defenses that, if successful, result in an acquittal. However, I don’t think that there are any sentences that reduce the punishment while leaving the conviction unchanged.